The main purpose of the design is to have a strong packaging that can bear external force to protect the eggs while shipping. Therefore the idea of using the structure of beehive come to mind. The shape of hexagon is a suitable for bearing the force. To save cost and to be eco friendly, the idea of not using glue is introduced. 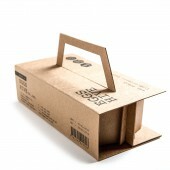 The material is made of kraft paper which is easy recycle. The divider is designed with insertion technique. 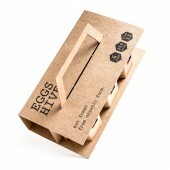 Eggs Hive is an egg packaging inspired by the structure of beehive. The hexagon form greatly enhances the strength of the box, since it can bear force better than any other shape. 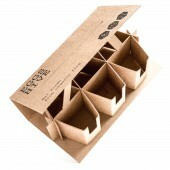 The package is made of kraft paper, which is raw, strong and eco-friendly, and assembled without use of glue. The handle is not just to make the box is easier to carry around, it also designed to lock the lid of the box as well. The consumers can be ensured that the package is eco-friendly to environment and non-toxic product. The packaging also concern about function, and designed to provide convenient to consumers. The handle is not just to make the box is easier to carry around, it also designed to lock the lid of the box as well. The eggs can easily picked up from the gap provided. The Project started in December 2011 and finished in January 2012. This project is assigned as university's course work, the design didn't get produce. The mock up is done by hand for course work submission. There are several concerns of designing this package design. The main purpose is to save cost and to be eco-friendly, the material chosen is kraft paper which is relatively cheap and easy recycle. For the same reason, I design to use only 1 soy ink colour here. The package also design not to use any glue on it. I choose to use a very simple technique here which is cut and slip the papers together. Before making any researches, the idea of making an eco-friendly egg packaging that does not using any glue came to my mind. Then after making some researches on internet and observation through out the existing product in the market, I find out that most of the egg packaging are very similar and lack of uniqueness. Mostly are made of plastic, carton, or both. However, there are some interesting packaging in the internet, but most of them does not look strong enough to protect the eggs. So I want to find the way to make the paper strong enough to protect them. With the goal of making an eco-friendly egg packaging that can assembled without use of glue but also strong enough to protect eggs. The slots were made into the shape of hexagon which inspired from honeycomb paperboard since it can bear force very well to hold the eggs in place. The next challenges is to made the box to have the middle divider inside. I realize that I can just simply extend the paper and fold it within one piece. After mocking up the package, I find it hard to pick up the eggs in the first mock-up. As a result I cut the slot as shown in pictures. Now the eggs can be easily picked up and you can see the eggs inside. 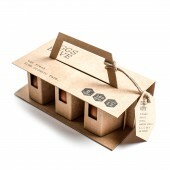 Hive Egg Packaging by Chaiyasit Tangprakit is a Nominee in Packaging Design Category. · Click here to register today inorder to be able to view the profile and other works by Chaiyasit Tangprakit when results are announced. Hive Egg Packaging by Chaiyasit Tangprakit is Winner in Packaging Design Category, 2016 - 2017. · Press Members: Login or Register to request an exclusive interview with Chaiyasit Tangprakit. · Click here to register inorder to view the profile and other works by Chaiyasit Tangprakit. Did you like Chaiyasit Tangprakit's Packaging Design? 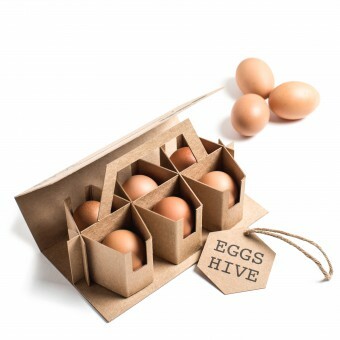 Did you like Hive Egg Packaging? Help us create a global awareness for good packaging design worldwide. Show your support for Chaiyasit Tangprakit, the creator of great packaging design by gifting them a nomination ticket so that we could promote more of their great packaging designs.